Emmakal: No-Prep Veneers: Are They Always the Best Solution? No-Prep Veneers: Are They Always the Best Solution? Dental veneers often form a major part of any smile makeover as this treatment is extremely versatile. If you are considering a smile makeover or any sort of cosmetic improvement to the appearance of your teeth, it’s highly likely veneers will be suggested. A veneer is a very thin shell that is perhaps similar to a false fingernail and which will cover up the front surface of a tooth. It is bonded to the tooth surface creating a relatively strong restoration. Veneers can be used to improve the overall appearance of your teeth. This means it covers up any that are badly stained or discolored. It also corrects other cosmetic problems like small chips and cracks or irregularities with the way teeth are spaced. They can even be used to correct small problems with alignment, where a tooth might only just overlap another or where it is slightly protrusive. Veneers can be made from porcelain or composite resin. 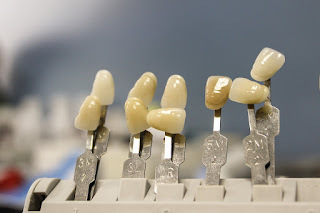 If you choose composite resin veneers then the resin is applied directly to the front surface of your tooth before being hardened, shaped and polished. Composite resin veneers are cheaper than porcelain. They will not last nearly as long and they may become stained after a few years of use. It can be a better long-term solution to consider porcelain veneers, which with the proper care could last for ten years or more. However, teeth do need to be prepared for conventional veneers. The amount of tooth structure removed isn’t significant. It is typically only a small amount of tooth material from the front of the tooth and may be the biting surface. The average porcelain veneer is around 0.5 mm in thickness so extensive tooth preparation isn’t necessary. It is important to remove a minimal amount of tooth structure as otherwise, your veneers could feel bulky and they may look unnatural. Even so, once any tooth structure has been removed it does leave the tooth more vulnerable to decay. It also means that the tooth will always need to be protected as this procedure is not reversible. A tooth that has been prepared for veneers will require some form of protection for the rest of its natural life. This goes for whether this is in the form of dental veneers or crowns. How Do No Prep Veneers Differ from Conventional Veneers? With no-prep veneers, any sort of extensive tooth preparation is unnecessary so your teeth will remain largely unchanged. Instead, these veneers are so thin, being typically the thickness of a contact lens. This is so that they can simply be bonded onto the front surface of a tooth without looking or feeling bulky and unnatural. This procedure is reversible, although your dentist will need to remove the dental cement used to bond the veneer. Minimal prep veneers are far more common and as the name suggests these only require minimal reshaping in preparation for the veneer. By removing just a tiny amount of material, the teeth can be reshaped to ensure a more visually appealing fit and finish. This technique might sound ideal, but really minimal prep and no-prep veneers are only suitable in certain circumstances. For example, your dentist might suggest this option if your teeth are too small. They may also be a good choice for repairing and restoring teeth that have become worn down, perhaps due to extensive teeth grinding. Minimal prep and no-prep veneers might be a good solution for closing up gaps in between teeth. It can also be a good solution for covering up teeth that are slightly stained or misshapen. One situation where they can be particularly effective is in covering up what are called peg laterals. These are the two teeth on either side of your upper front teeth, and which in some people will be too small and underdeveloped. Covering them up can create a more visually appealing smile in a way that is very non-invasive and quick. If your tooth enamel is in good condition, it’s frequently possible to bond no-prep or minimal prep veneers directly onto the tooth surface. With this procedure, you may not even require dental anesthetic and it’s unlikely to create any problems with tooth sensitivity. Another advantage of choosing this type of restoration is that you won’t need any temporary veneers. This procedure is extremely non-invasive and is often reversible because the teeth will still be intact underneath the veneers. However, it is important to bear in mind that it is not always easy to remove veneers as they are bonded onto the teeth very firmly. With conventional veneers, some tooth preparation is required. Once the teeth are prepared they usually need to be covered up with temporary veneers to prevent issues with tooth sensitivity and to protect the teeth. This isn’t necessarily such a bad thing, as often temporary veneers are created to closely mimic the final restorations. This allows patients to have a sort of trial run of their teeth before the permanent restorations of made. This means if any alterations are required, they can be made before the permanent veneers are ready to be bonded onto the teeth. Any patient visiting their dentist will always be advised to have the most conservative treatment possible to achieve their desired outcome. If dentists feel that no-prep or minimal prep veneers are a good solution for your smile makeover, your dentist will definitely suggest considering this treatment. Unfortunately, there are often times when these types of veneers simply aren’t suitable. Adding even the very thinnest veneers onto the front of the tooth surface without preparing it will not produce the desired results. When used in the correct situations, minimal prep or no-prep veneers can make a huge difference to a smile in a very short space of time. It’s very important to be clear about your aims and desires before work begins. Although no-prep or minimal prep veneers are very non-invasive, they may not work well for anyone who wants to make a significant change. Especially to the appearance of their teeth or to their color.